When my best friend and I were 15 and lived in our small town of Asbest (remind me to tell you one day about my sweet little town, the largest producer of asbestos in the world) there was literally no place for us to hang out. Don’t judge my use of “literally” here. I mean it. There was literally no place for us to go, but a bench in front of my friend’s apartment building, which was always occupied by grannies gossiping about our slutty short skirts. 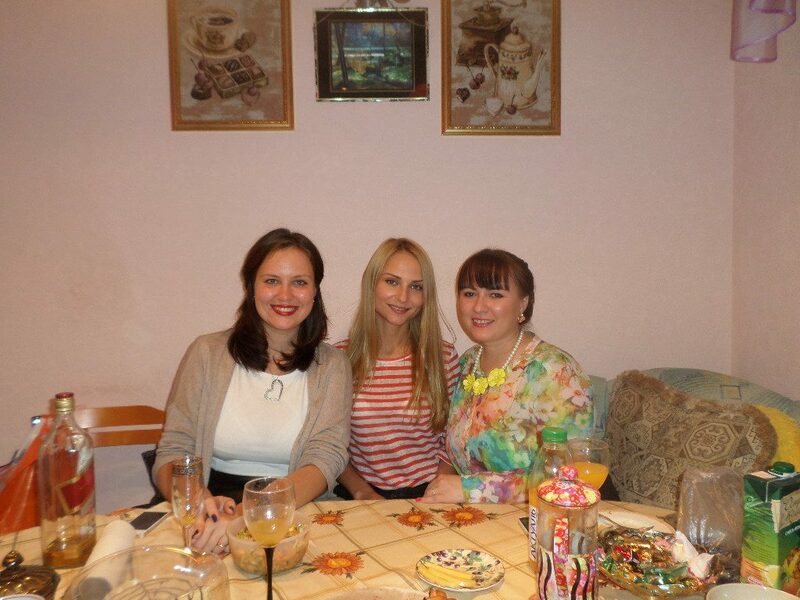 With no other place to go, we spent our free time at Masha’s house. More specifically, the kitchen. We would sit at the table, eat, watch TV, and chat for hours. I probably have to mention that a lot of Russian kitchens have TV sets. When you cook several times a day, every day, it might be handy to have some kind of entertainment in the kitchen. 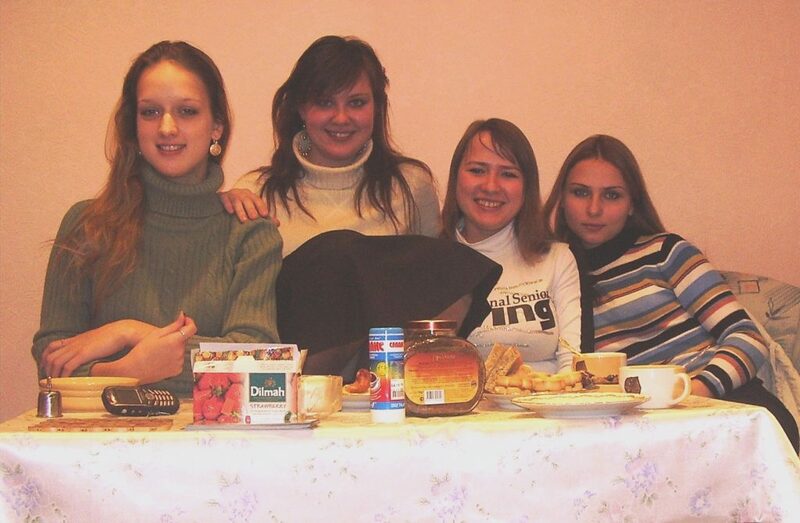 My girlfriends and I at Masha’s kitchen around 12 years ago. Masha is on the far right. I am second from the left. So many questions I have to myself. Like what’s up with my outfit and why do I have a 70’s hairstyle when the year is 2005. Masha’s mom made sure that the table was never empty. It felt like magic that no matter how much we ate, the food multiplied in front of us instead of disappearing. We ate candy till we had to unbutton jeans. And sometimes Masha’s parents even poured us a little bit of wine. It was haven. Then we moved to a big city and became students. I lived in dormitory. Masha rented a room in apartment. When I came over, guess where we spent our time? It was a different kind of kitchen in that apartment. Small, renovated probably a decade ago, and not very well maintained. Food carefully prepared by mom was replaced by instant noodles. Wine – by cheap cocktails from tin cans. I am still surprised that not on one occasion we ended up in ER after drinking those “cocktails”. They tasted horrible, didn’t have one real ingredient inside, but they were cheap and enough to make us tipsy and giggly. We stayed till wee hours of the morning drinking that monstrosity and discussing everything from boys to… boys… at that time it was mostly boys and our (non-existent) love life. Masha’s kitchen. 2014. I think I can confidently say for all of us that we look much better in our late 20’s than we did at 17. Our love for spending time in the kitchen didn’t come out of nowhere, it was inspired by parents. As long as I can remember myself, whenever people came over to our house, they always ended up crammed up in our tiny kitchen, sitting around one table on uncomfortable stools, eating, drinking, laughing. There is a saying in Russian: «В тестноте, да не в обиде». I tried to find an official translation and came across one that technically sounds correct, but also extremely sexual: squeezed but pleased. Let me know if it’s something dirty. I mean no disrespect. In my own words, the proverb translates to: there’s little space, but no one is offended. Meaning there’s space for everyone, everyone is welcome. Even if a party started in the living room, people eventually migrated to the kitchen. One by one, slowly, but surely. It didn’t matter that the living room had more space and a dinner table was set up there for the occasion. By the end of the night, the kitchen would draw people in like a magnet. 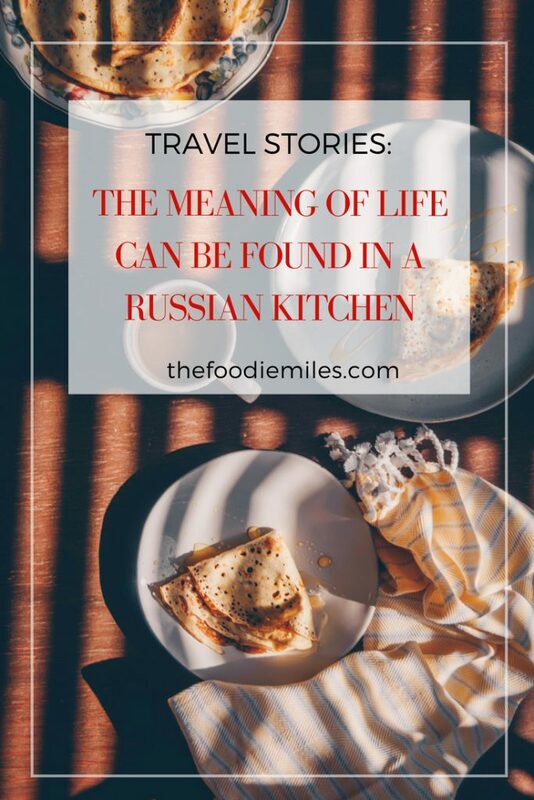 This a memory shared by all Russian people: late night talks about the meaning of life in the kitchen. 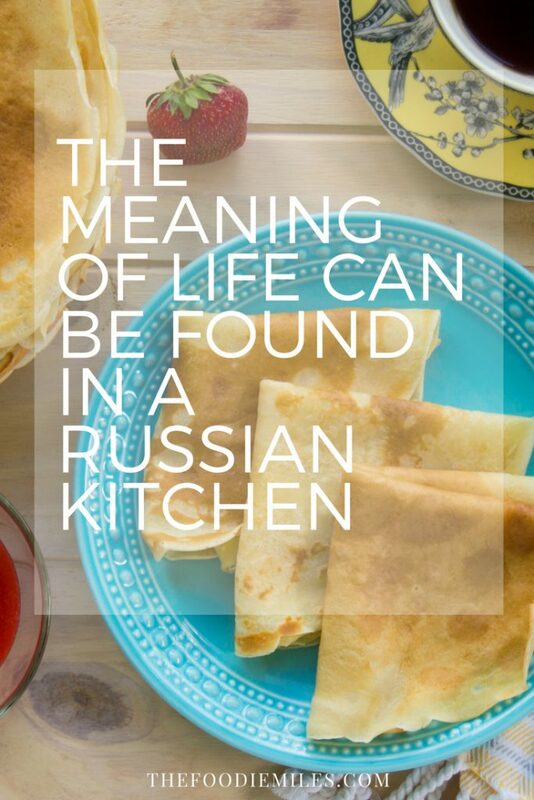 For there’s no place where Russians discuss the meaning of life, but in the kitchen! At my friend Anya’s kitchen, doing fortune-telling during Christmastide. I can only guess the reasons behind this unusual, but heartwarming habit. As strange as it may sound, one of the reasons is, possibly, how small kitchens are in Russia. Being small is not a disadvantage, it’s what makes it cozy, homey and private. You sit side by side with your friends and family, brushing elbows and feeling close not only on a physical level, but on a spiritual level too. You can’t talk about weather with a person whose eyes are 5 cm away from yours. You talk about life. An added advantage is the proximity of refrigerator. Food and drinks are always an arm’s reach away. In especially small kitchens you might even be able to grab something from the fridge without having to get up from your seat. But where it really comes from is our Soviet past, I believe. In the beginning of twentieth century, after the revolution of 1917, Soviet Union undertook a path of urbanization. Driven by poverty and collectivization, many people moved from rural areas and villages to the cities, creating great pressure on existing housing market. In attempt to resolve this problem, the government came up with a new type of accommodation – communal apartments. These apartments were meant to be shared by several families (in the best case scenario – by two families, in the worst – by seven or eight). Each family was given a room that served as a dining room, living room, and bedroom all at once. Hallways, bathroom, and kitchen were meant to be shared by all families. That’s why a kitchen was not only a place to prepare food, but a space where people crossed paths and socialized. If there was a celebration, the table was set up in the communal kitchen. Even after communal apartments were long gone, and families were given their own flats, kitchen was still the heart of every home. I say “given” because until 1991 an individual couldn’t buy property, instead government gave it out. The flats were usually small, with one bedroom, a living room, and a kitchen. The word “dining room” wasn’t even in people’s vocabulary, unless it was used in the same sentence as the word “bourgeois”. Dining table was usually set in the kitchen, and that’s where families had meals on a daily basis. For holidays and celebrations, when a lot of guests were expected, the table would be moved from the kitchen to the living room. That was the case in my parents’ apartment too. When the closest family and friends came over, we skipped the hustle of moving the table and simply gathered in our small kitchen. When I moved to America, the days of my kitchen chit-chats were over. In USA, houses usually feature a separate dining room with a table for eight to twelve people. So bourgeois! In apartments, kitchen is often connected to the living room, creating one big open space. The feeling of secluded, cozy, and private kitchen is lost. I really miss that feeling and late night talks too. When I travel to Russia to see family, my parents pick me up at the airport and drive me home. No matter what time of day or night it is, when we arrive my mom puts a kettle on the stove, we sit in the kitchen, drink tea, and talk. I’ve spent so many nights in the kitchens, big and small, old and new, granny-style with flowery wallpaper and uber-modern with shining surfaces, but one thing remains the same. Once you share food and drinks with someone at the kitchen table, in the wee hours of the morning, you become deeply connected. You might not turn into best friends, you might even not see each other ever again (for strangers often meet in the kitchen), but by the end of the night, you will look into the darkest corners of each other’s souls, you will share most guarded secrets, and you will find the meaning of life if only to forget all about it once you sober up in the morning. I really enjoyed reading this! My husband is from Belarus. He moved to the USA only 8 years ago, so I know this would bring him memories of home. World travelers will never forget where they came from! Really enjoyed this read and it reminded me of a book called, “Mastering the Art of Soviet Cooking: A Memoir of Food & Longing.” She talks about her life, and the life of her family, through food and what food meant at different times. It’s a pretty interesting read. Oh I’ve seen this book and thought it was a really great idea to show the life of Soviet people through food. Didn’t get a chance to read it, but now with your recommendation, I think I’ll push it to the top of my must-read list! Always love your beautiful writing, Yulia. <3 Hung onto every word of this post! Food, history, and culture all at once–perfect combination. Thank you, Kate! This is the best compliment I could receive!